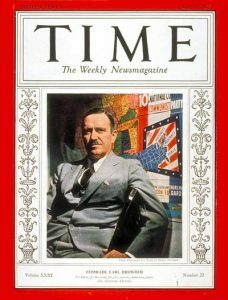 Let’s take a dive into some informed speculation; Was Earl Browder, the former head of the Communist Party in the United States on the CIA’s payroll? Earl Browder is also the grandfather of Bill Browder, a renegade financial scammer that fled Russia and the US to avoid taxes. He now resides in London. Back to the document above; researcher Lisa Pease posted this to Twitter, and in a brief exchange we bounced a few ideas around concerning the name “Browder” listed in the document. The document was written by C.D. 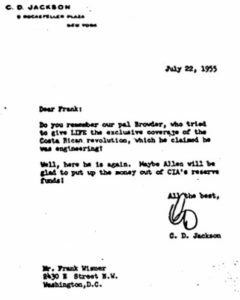 Jackson to Frank Wisner of the CIA. Jackson is one of those “behind the scenes” manipulators of cold-war politics. From the overthrow of Guatemala to shelving “The Zapruder Film” of the Kennedy assassination, C.D. Jackson was meddling behind the scenes. “Allen” refers to Jackson and Wisner’s good friend and head of the CIA, Allen Dulles. If the individual named as “Browder” was indeed Earl Browder of the Communist Party USA, is it possible they are not joking; that Browder may have at times recieved money from CIA slush funds? Could Earl Browder have been a cats-paw for the CIA like his grandson Bill Browder (Magnitsky Act) is a cats-paw for US foreign policy? Was the American Communist Party infiltrated and partially funded by the CIA? Thanks to researcher Lisa Pease for posting the document and entertaining my comments and questions. This entry was posted on September 4, 2018 at 7:30 pm and is filed under Book review, Hidden History. You can follow any responses to this entry through the RSS 2.0 feed.